On 20 May, the 11th Annual National NETTY Internet Awards took place at Park Inn by Radisson in Baku, Azerbaijan. 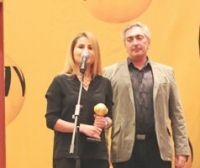 NETTY awarded the year’s best Azerbaijani online-resources, internet projects, innovative individuals in IT and IT events in 16 different categories. The Best IT Event of the Year went to BakuTel 2014, the 20th anniversary telecommunications and IT exhibition. The NETTY award was presented to Rena Abutalibova, Project Manager of BakuTel, by Dmitry Andrianov, Director of the Info City magazine, long-standing provider of media support to the exhibition. Ms Abutalibova expressed her gratitude to the organisers and invited all those present to BakuTel 2015, which will take place from 2-5 December 2015. At the end of the official ceremony, Elmir Velizade, Deputy Minister of Communications and High Technologies of the Republic of Azerbaijan gave a speech. Mr Velizade confirmed BakuTel’s significant role in the development of the IT sphere. Over a number of years, BakuTel has become the partner of the NETTY Internet Awards. This year, the competition took place with support from the Ministry of Communications and High Technologies of the Republic of Azerbaijan and the Ministry of Culture and Tourism of the Republic of Azerbaijan.